The AT-VGA12A is a solution for distributing a VGA signal to 2 separate displays. This VGA distribution amplifier has a feature no other does, backup power systems. This is the perfect solution for displays that require to be on at all times. The AT-VGA18A is a solution for distributing a VGA signal to 4 separate displays. This VGA distribution amplifier has a feature no other does, backup power systems. This is the perfect solution for displays that require to be on at all times. The EZ-VM12 is a high-resolution computer video distribution amplifier with two outputs. The input has an associated front-panel BIT ID switch to assure compatibility with various computers. The EZ-VM13 is a high-resolution computer video distribution amplifier with three outputs. The input has an associated front-panel BIT ID switch to assure compatibility with various computers. The EZ-VM14 is a high-resolution computer video distribution amplifier with four outputs. The input has an associated front-panel BIT ID switch to assure compatibility with various computers. The EZ-VMD2 is a high-resolution computer video distribution amplifier with two outputs. The input has an associated BIT ID switch to assure compatibility with various computers. The EZ-VMD4 is a high-resolution computer video distribution amplifier with four outputs. The input has an associated BIT ID switch to assure compatibility with various computers. The EZ-VMD4E is a high-resolution computer video distribution amplifier with four outputs. The input has an associated BIT ID switch to assure compatibility with various computers. HDMI and VGA 2x1 switch. Switch between 1 x HDMI and 1 VGA input to 1 VGA output. VGA amplifiers are designed for routing computer-video signals to a monitor or HD display. Many people have abandoned VGA for HDMI or DVI, however the use of VGA amplifiers are still common in schools, multi-media rooms, gaming areas as well as big screen display environments. These units use the VGA 15-pin connector for video signal with audio as an option. VGA DA’s may be portable, rack mountable or wall mountable and making them an ideal solution for many applications requiring high performance of computer-video signals. VGA distribution amplifiers come in as small as a 1x2 or in a larger chassis like a 1x32. 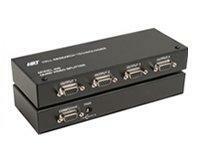 These units accept a single VGA input and act as a splitter distributing to multiple outputs. The most up to date distribution amplifiers can output video in high resolutions up to 2K (2048 x 1536) for displaying content in standard or high resolution. We have partnered with industry leaders including Atlona, Kramer, TVOne, Gefen, Magenta and Hall Research to name a few. If you are still confused or have any technical questions regarding your application, please call one of our tech savvy representatives to assist with your purchase.